We had this planned all along. We’ve been meaning to come here but it has always remained just as a plan. Shame on us for not having bothered to visit this wonderful gem... until last August 19, 2017. It was the day before my birthday. 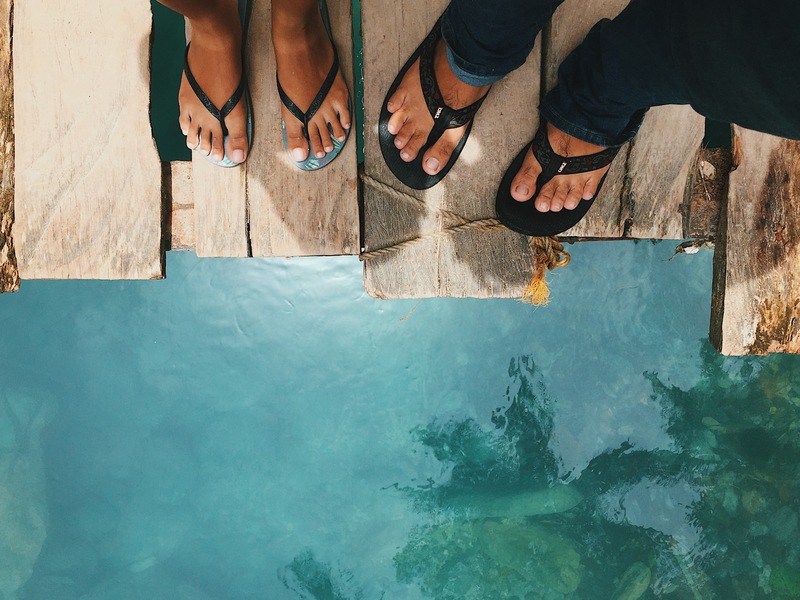 We knew we just had to satisfy our inner wanderlust once more. So, off to Badian we went for my 2-day birthday celebration! I had an itinerary in mind ‘cause I really wanted to explore South Cebu as much as possible especially that I was on leave for 2 days. Technically, the first day is my rest day, but really, whatever! Point is that we were out to venture the south for 2 days. What a way to celebrate my birthday! The night before, we already had everything packed, everything on our checklist ticked off. We were prepared and excited as hell. I barely had sleep that night, but the baby-ik got knocked out almost immediately. Poor baby-ik. We agreed on waking up as early as 3am to prepare, but I let the baby-ik sleep in a bit more while I prepare everything myself. I cooked and prepared packed lunch for the both of us. I knew we’d get hungry on the way considering the long hours of travel time. I really just didn't want to ruin the day by getting all grumpy because of hunger. Yes, I get grumpy very easily, it gets annoying sometimes, and I had to avoid it this time. After an hour or so, I finally had to wake the boyf up so we could get there a bit earlier and so that we'd have more time to explore the place. We arrived Panagsama, Moalboal earlier than expected at around 8am. I had booked a private room through Airbnb and our standard check-in time was supposed to be after lunch. Our lovely host was still sound asleep that time so we just decided to leave our things in their front desk slash restaurant, and then wandered around Moalboal and Badian while we wait for our check-in time. 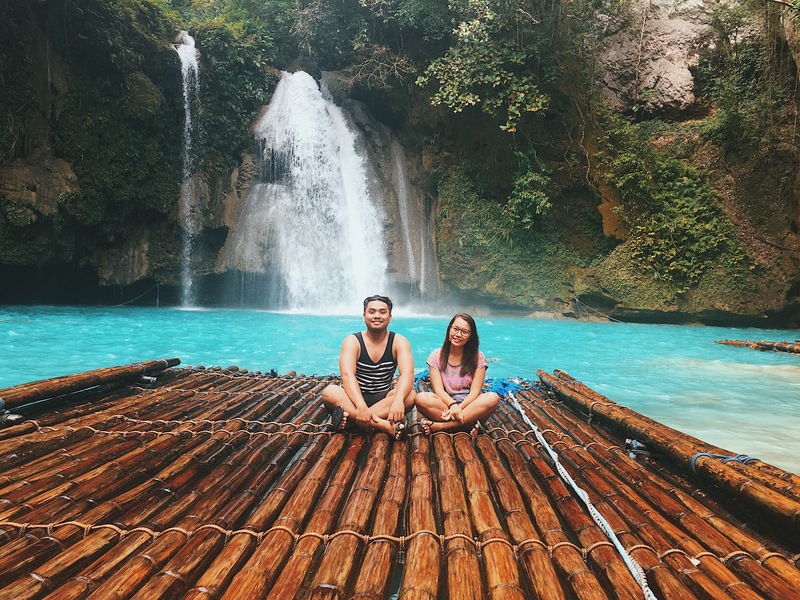 Of course, we decided to visit Kawasan Falls first. Upon arriving there, we were greeted by a guy who assisted us in parking our motorcycle. There, I remembered one important tip from blogs I've read saying that paying for a guide isn’t really necessary and that we’d be able to reach the falls on our own just by following the trail. Although, this guy didn’t really insist on being our guide, he very eagerly followed and assisted us all the way to the falls. At first, we thought he was just being a friendly local who wanted to help, but later on, it became clearer that he was expecting to be paid for his “service" even without our confirmation. Surely, we didn’t need a guide, the trail was well-cemented and wasn’t that hard to follow. No complaints whatsoever about the 10-15 minute trail, despite the fact that I am almost annoyed by the guide we never really asked for -- view was fantastic on the way to the falls as trees lined up along the trail, welcoming us. Locals took a bath by the river flowing towards the sea. We even sighted a few women doing their laundry just under the rock bridge. Too bad I wasn't able to take a photo though, but I am happy that we get to be at peace with nature. We finally arrived and the guide never really left. He kept offering us tables, life vests, and whatnots to rent. I initially didn’t want to rent a table as I didn’t plan on staying there for too long. Just a few hours of swimming maybe and then we’ll be off exploring some other place. But this guy was really persistent. He says he’s willing to watch out for our things while we go swimming. The baby-ik eventually gave in to his offer, and rented out a table which was supposedly 600 Php (according to the guide), little did he know that we saw the sign by management, saying tables are for rent for only 300 Php. Blogs I've read pointed this amount as well. In the end, we paid just 300 Php after supposedly “haggling" with the guide. I don’t want to sound discourteous in this entry, but he's gotten irritating. But then again, I didn’t want to be rude, and I didn’t want to ruin the vibe, so I let him be. 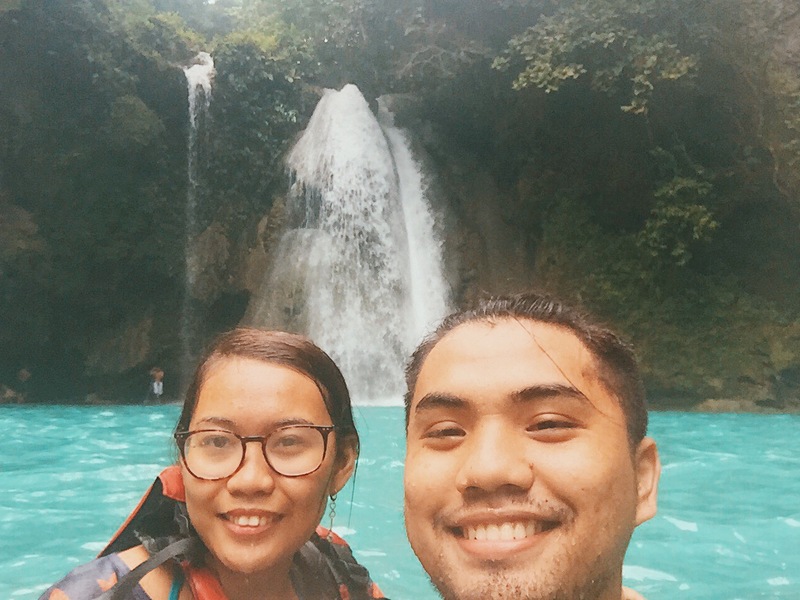 We just swam in the cold waters of Kawasan Falls and enjoyed every minute we have there left. 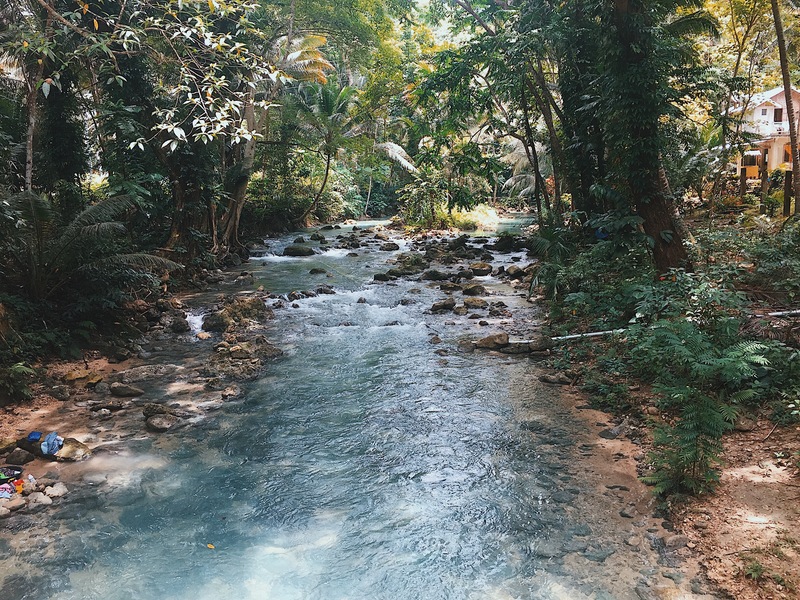 Expectedly, Kawasan Falls really was a sight worth waking up early, and the exhausting long hours of motorcycle ride. 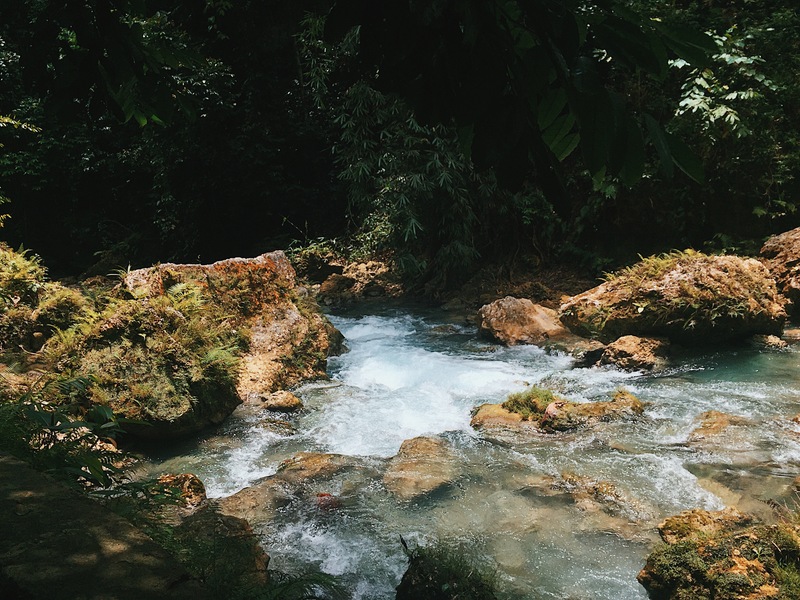 The waters were milky blue (or was that turquoise?) but still very clear. We were lucky the place wasn't that crowded yet when we got there. Later on, however, influx of people came to witness the amazing view and experience the hydromassage. By noon, it has already gotten really crowded and noisy. My superstitious side just silently hoped no "diwata" or "engkanto" were disturbed. Although some expectations weren't met, I still loved the place. 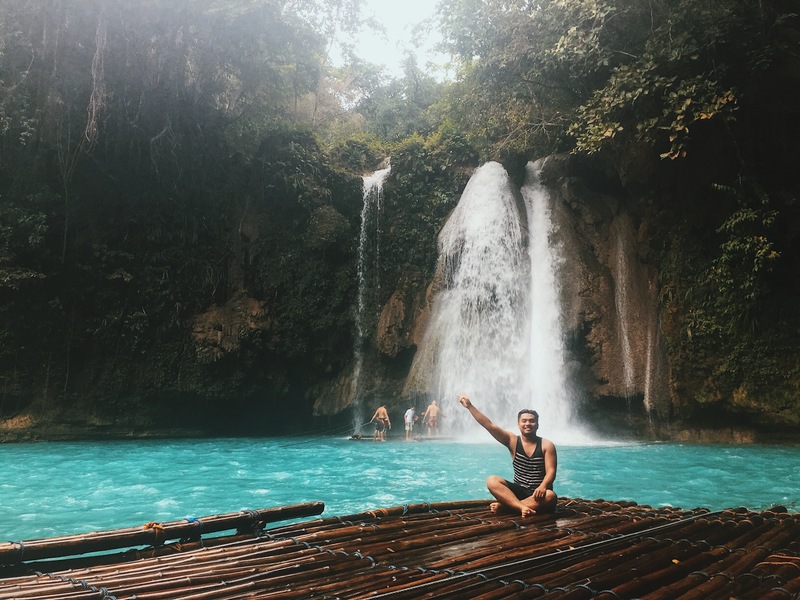 Correct me if I'm wrong but I've heard that Kawasan Falls has 7 falls in total -- this was confirmed by the guide who accompanied us, and by a workmate who lives in Alegria -- but I think only 3 are well-known to the public. The baby-ik and I didn't bother to go further than the first falls though because it seemed to us that every move we make will have corresponding charges. I just wanted to set clear expectations for those who plan to visit: The tranquility and serenity of the place I expected were ruined by the crowd. It wasn't what I expected, but still, it was an experience I will never forget. We spent around 3-4 hours just swimming and taking photos until we finally decided to rest for a bit in the room we've rented in Moalboal before we explore the rest of Moalboal and Badian. Yes, we ended up paying the guide bc we didn't want to be rude and despite being annoying, he was nice afterall. You can ride a cab to South Bus Terminal, just beside E-mall. 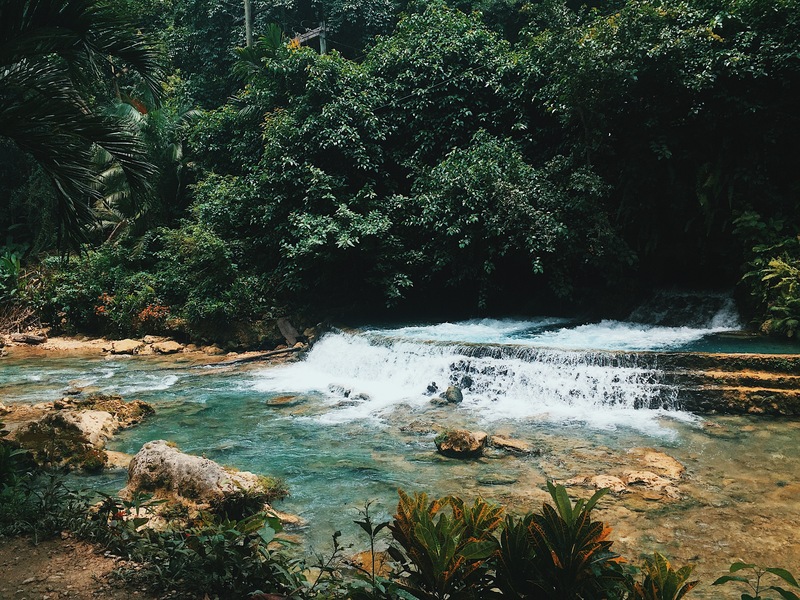 Tell the driver to drop you off Kawasan Falls. You will be dropped off at Matutinao Badian Church. PS I didn't mean to sound rude with the guide. I just wanted to be blunt about my experience since he seemed too pushy, and a bit overpricing when asked for specific rental rates. Thank you so much for sharing your experience, Baby-ik Diaries! This place is lovely! I was born and raised in Cebu (lived there for fifteen years) and I never got a chance to visit this place - still forever bummed from it but it's great seeing it in posts. Wow! This is just amazing. 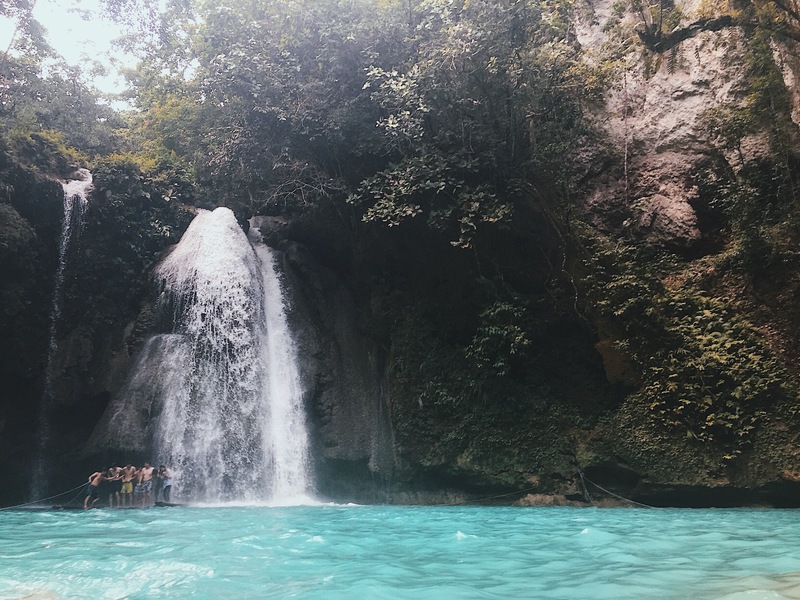 Kawasan Falls is amazing.